Fall is here and we are spending as much time as we can outdoors, before the weather turns. Recently we started playing at a new to us park and my children cant seem to get enough of it. For us it’s just off of our route home from school so it’s the perfect place to stop and get out the last bit of wiggles before dinner time. 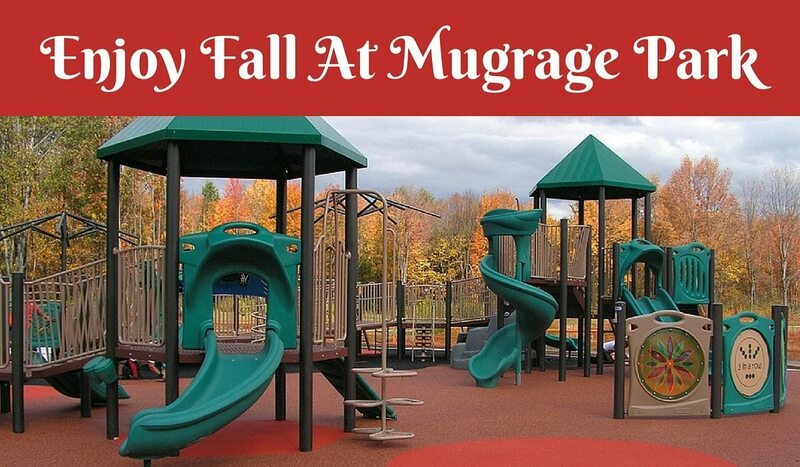 Keep reading to see how much fun Mugrage Park is for the whole family. This Medina, Ohio playground is an interactive area for children of all ages. My sons have never told me they are bored here. In addition to the standard playground items there is also two rock wall areas and a modern merry-go-round that is much safer then the ones from my childhood. The swing set has several standard swings and one handicap accessible. My boys love the merry-go-round and rock climbing areas. The whole playground surface is poured rubber and there is a water fountain in the playground area with restrooms near by. We have yet to spend time at this Medina, Ohio dog park but it does have a 5 foot high fence around it and offers over an acre of space for small dogs and a second are for large dogs that is more than 6 acres. There are also paved paths and grass trails. So you can keep the dog busy too! Grab your poles and get ready to some fun at Mugrage Park’s three acre catch and release fishing pond. We always see families standing on the side catching fish and having a wonderful time. Just make sure to put the fish back. Not far from there is also nice picnic shelter with picnic tables, so feel free to pack a lunch and stay for a while. This entry was posted in Activities, Ohio, Parks & Playgrounds and tagged Medina, Park, Playground.